It was June of 1966 and the New York Yankees were dissolving faster than a wet Alka Seltzer. Two season’s earlier, the team had fallen three runs short of winning a World Series, but here they were, just twenty month’s later, floundering in seventh place in the AL standings. Everybody knew they needed major help immediately and that included their competition. It was fun for the other AL teams to watch the once mighty Yankees get their comeuppance. Even if their own ball clubs were in need of players, no other AL franchise was willing to help much with New York’s retooling effort via a trade except of course the good old Kansas City A’s. But unlike in years past when the A’s would serve up outstanding talent like Roger Maris, Clete Boyer and Hector Lopez to their Big Apple brethren, Kansas City’s front office had been taken over by the eccentric and extremely stingy Charley Finley in the early sixties. Well aware that the Yankees had exploited the A’s in previous player transactions, Finley refused to even deal with New York for years and when he finally did, the trades were no longer one-sided affairs. As things turned out, it was one of those trades that had little impact on either team. Talbot was immediately inserted into the Yankees’ starting rotation. He would go 7-7 for the Yankees during the balance of the 1966 season and then 6-8 the following year. 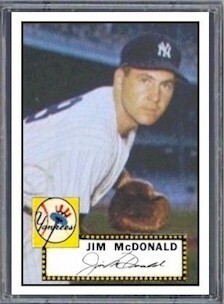 But his ERA was north of four both those seasons and in 1968 he was demoted to the Yankee bullpen. He did worse as a reliever, finishing the year at 1-9. The Yankees traded him to the Pilots in 1969, getting Jack Aker in return, who turned out to be a great closer for New York during the next three seasons. Talbot, on the other hand did little for the Pilots except become fodder for Jim Bouton’s best-selling “Ball Four” chronology of the Pilot’s 1969 season. He then found himself back pitching with the A’s in 1970 and ’71, his final two big league seasons. He finished his 8-year career with a 38-56 record. Update: Talbot passed away on January 11, 2013, at the age of 71. Talbot was born on the same exact date as this former AL strikeout leader and also shares a birthday with this former AL MVP and this one-time back-up Yankee first baseman. 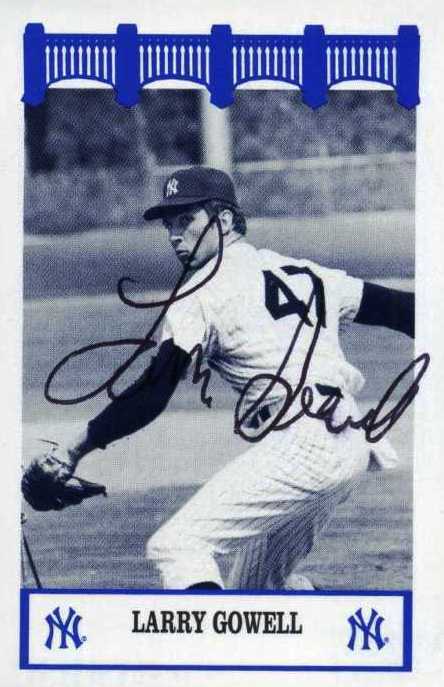 The only Yankee player in history to be born on June 13th was a journeyman pitcher named Darrell May. The Yankees picked May up from the Padres in July of 2005 in exchange for another reliever named Paul Quantrill. May had made his big league debut in 1995 for the Braves but by 1997, he had pitched his way back to the minor leagues. The Royals brought him back to the Majors in 2002 and he was a member of the Kansas City starting rotation for three seasons. His best year was 2003 when he went 10-8 for KC with a career low ERA of 3.77. The following year, May led the League in losses with 19 and he was traded to the Padres. He went 1-3 in San Diego before getting dealt for Quantrill and he made just two appearances in pinstripes, getting rocked each time and he lost his only decision as a Yankee. He pitched in the minors for one more year then hung his glove up for good. May was born on this date in 1972, in San Bernardino, CA. The most famous ballplayer and only Hall of Famer ever born in that same city was the great big league pitcher and former Yankee manager, Bob Lemon. Darrell became the third player named “May” to play in pinstripes joining pitcher Rudy May and outfielder/DH Carlos May. Al Mamaux seemed to be on top of the baseball world after putting together consecutive 21-victory seasons for his hometown Pittsburgh Pirates in 1915 and ’16. 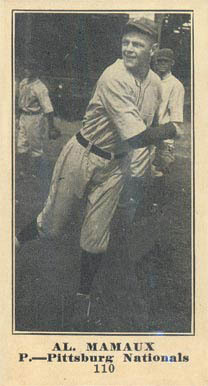 His bubble quickly burst the following season, however, when he went just 2-11 and was also suspended by Pittsburgh Manager, Hugo Bezdek for violating “team rules” during a road trip to New York. When I first found out about the suspension, it caused me to surmise that perhaps Mamaux, who was just 22 years old at the time, had let success go to his head. A closer look at this right-hander’s season stat lines indicated other reasons may have existed for his quick and precipitous downfall. During his two big seasons with the Pirates, he had pitched more than 550 innings of baseball, far more than he had ever thrown over a two season period. All those innings must have put a tremendous strain on his young right arm because he was never again able to approach that same level of success in the big leagues. The Pirates traded him and Burleigh Grimes to Brooklyn in 1918 in a deal that sent future Yankee skipper Casey Stengel to Pittsburgh. Mamaux hardly pitched for his new team in 1918 but recovered to win 10 games in 1919 and 12 more in 1920. He would spend a total of six seasons with Brooklyn and his big league career was just about over when the Yankees purchased his contract in 1924. He appeared in 14 games for New York in 1924, splitting his only two decisions. That performance ended his big league playing days but put him on the path to his second career as a very successful manager of the Yankees’ Newark Bears farm team. Before he took over as Newark’s field boss, he anchored the Bears starting rotation for four seasons during which he won 79 games. In 1930 he replaced Tris Speaker as skipper of the Bears. His Newark teams were considered the very best in that proud franchise’s illustrious International League history and Mamaux would later become a highly regarded college coach at Seton Hall. The only other Yankee born in this date made his debut as a Yankee pitcher during the same season Mamaux became the Bears’ manager. Yankee fans, the Yankee press and even some of his own Yankee teammates had not been too thrilled with this right-hander’s performance since he came to the Bronx in a November 1951 trade that sent a good-looking New York prospect by the name of Clint Courtney to the Browns. Born in Oregon and raised in Modesto, California, McDonald spent his first season in pinstripes pitching mostly out of Casey Stengel’s bullpen with an occasional starting assignment thrown in the mix. After a couple of rough early outings, he had started throwing very well and when July rolled around his ERA was under two. That’s when he had an eight game stretch in which he lost three decisions, blew a save and doubled his ERA. Meanwhile, Courtney was having a solid rookie season for the Browns and every time the Yankees played St. Louis, he seemed to have big days at the plate. It was looking like the Yanks had made a very bad deal. Fortunately for McDonald, Yankee pitching coach Jim Turner had faith in him. When the ’53 season rolled around, New York’s Holy Trinity starting three of Reynolds, Raschi and Lopat had all reached their mid-thirties and required more rest. In June of that year, Turner started using McDonald as his team’s fifth starter and he did OK, finishing the season with a 9-7 record and an ERA of 3.82. McDonald then pitched sparingly but well for New York in 1954, winning four of his five decisions and lowering his ERA to 3.17. Then that November, in one of the biggest and most complicated trades in baseball history, he was traded to the Orioles in a transaction involving sixteen players. He pitched in the big leagues until 1958. McDonald shares his birthday with this former Yankee owner, this former Yankee DH and this former Yankee pitcher. I love writing this blog because I learn such interesting things about players who wore the pinstripes. Take today’s birthday celebrant as an example. I very clearly remember when Larry Gowell made his debut with the Yankees way back in 1972. He was considered a very good prospect at the time but he had one serious handicap. He was a member of the Seventh Day Adventist Church and as such, it was against his religious beliefs to work from sundown on Friday to sundown on Saturday. This meant he could not and did not pitch in any baseball games on a Friday night or Saturday afternoon. 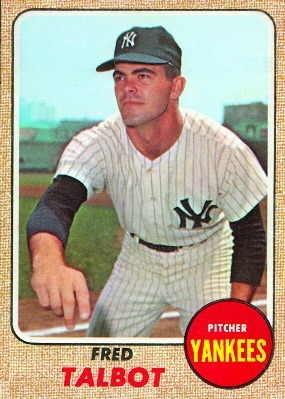 Still, his slider was good enough to get him promoted to the Yankees for a cup-of-coffee look see in September of 1972. He would appear in just two games as a Yankee and as a big leaguer, yet he still became part of baseball history. His first big league appearance was a hitless two-inning relief stint against the Milwaukee Brewers. Two weeks later, Yankee manager Ralph Houk gave the Lewiston, Maine-born right hander his first and only big league start against that same Brewer team. Although Gowell took the loss, he made MLB history when he hit a third inning ground ball double off of Milwaukee’s Jim Lonborg. That hit turned out to be the very last hit by an American League pitcher before the League’s new designated hitter rule went into affect. 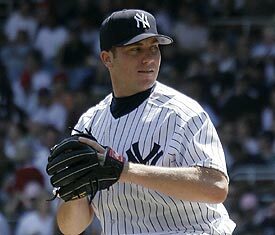 Gowell would spend the next two seasons in Syracuse pitching for the Yankees’ triple A franchise. He left baseball after the 1974 season. During my research for this post, I found a reference to Gowell in a book about offshore insurance schemes of all things. Robert Tillman, author of the book alleges that in 1996, Gowell sold a worthless $100,000 promissory note on behalf of a company called Legends Sports, that was supposedly constructing a string of golf courses and entertainment centers in the southeastern United States. The note was supposed to pay the purchaser a twelve percent annual interest but instead, proved to be worthless when it was discovered that the owners of Legends Sports were operating a Ponzi scheme. I wonder if Gowell made the sale of that bond on a Friday night or Saturday afternoon. I hope not because according to his religion, that would have been a sin. Gowell shares his May 2nd birthday with a Yankee pitcher who got in trouble when he barnstormed with Babe Ruth. This native of Rapid City, SD is one of only two all-time Yankee roster members I could find who celebrate their birthday on May 1. He went to high school in Roswell, New Mexico, site of the space center where most of America’s space rockets were originally designed. Appropriately, this southpaw had a rocket for a fastball but not much else. The Yankees selected him in the 34th round of the 1998 amateur draft. He got the attention of the parent club’s brain trust in 2001, when he went 14-4 and led every minor league player in the country with 220 strikeouts. 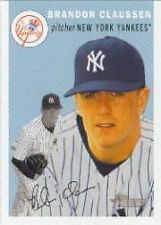 Claussen ended up appearing in only one game for New York, a single start during the 2003 season in which he was credited with the victory. That win however, was not Brandon’s only contribution to helping the Yankees get into that season’s World Series. He was also included in the July 2003 trade with the Reds that brought Aaron Boone to the Yankees. He had a 10-win season for Cincinnati in 2005 but after a bad year in ’06 he was out of the big leagues for good. Claussen shares his May 1 birthday with another pitcher who played for the Yankees over a century earlier.